On two wheels – NFP tweetup 22, 6 March 2014. The digital journey for London to Brighton Bike Ride, the British Heart Foundation’s flagship fundraising event and Europe’s biggest charity bike ride. Kate Brennan, Senior Digital Engagement Executive at the British Heart Foundation, talked about the challenges involved in supporting over 28,000 riders using social media and digital to help raise funds. The content is mostly user-generated, so the question is generally an editorial one, of what and who to show off. 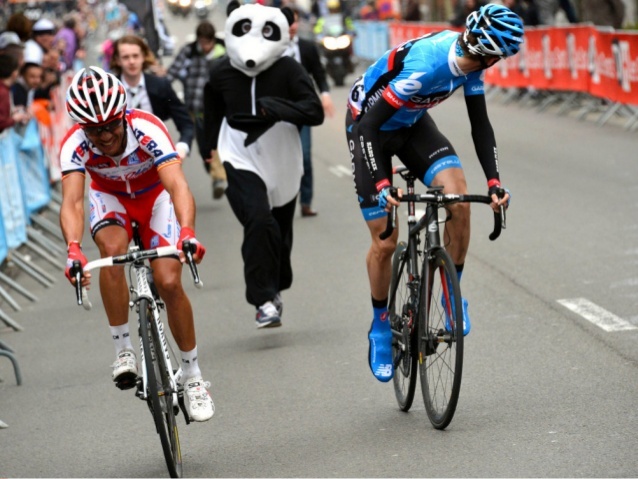 A six foot panda and the Tour de France? My favourite presentation of the evening. Adrian Cockle, Digital Innovation Manager for WWF International, talked about how luck, good circumstances, a silly conversation on Twitter led to a great fundraising/partnership opportunity. – A few years ago, Dan Martin (in blue) was neck-and-neck with a rival at the closing section of a stage of the Tour de France. – At this point, he was chased on to victory by a spectator dressed as a giant panda, which became a sort of mascot for the team. We need a panda, now. Anyone? Panda! Hurry the F up with the Panda! @WWF much love for the spiritual Panda you sent today. We got the win. Without the Panda, it wouldn’t have happened. @WWF If you guys have any interest in some sort of partnership, I think it’d be a home run. Plus putting a Panda on the uniform! This interaction was followed by further discussion and meetings, and led to WWF connecting with cyclists – who are a good fit for their cause. This wouldnt' have happened if Adrian wasn't empowered, trained and trusted to take advantage of this opportunity. If your organisation's conception of social media is risk management, then you can't expect things like this. Perhaps you could use the above as a case study to help show people in your organisation the power of twitter. I think the most important learning point here is that twitter has brilliant potential for connecting with other people with shared interests, in a potentially serendipitous and awesome way.